Clearly eager to capitalise on their recent acquisition of popular teen-orientated polling app ‘tbh’, Facebook have wasted little time in bringing a newly-improved polling feature to their users at large, as announced late last week. Many Facebook-owned platforms, including Instagram and Messenger, have incorporated a polling feature for quite some time now, with a basic text-based version of the feature even available for Pages on the main platform, so it is a little surprising that this new feature has taken so long to emerge on the main app. It is worth noting however that Facebook’s newly-enhanced Polls feature is a very different beast to its predecessor. While the polling feature available to Facebook Pages until now was limited to purely text-based responses, the new version carries a decidedly more eye-catching aesthetic that is sure to increase engagement as compared to its plainer cousin. To create a poll all you need do is select “What’s on your mind?” as you would to post a standard update and find “Polls” in the subsequently-revealed drop-down menu. You will then be presented with a blank box in which to type your question, for which there is no upper character limit, and spaces to add two, but only two, responses each with an upper limit of 25 characters. These polls can then be enhanced via the application of photos, GIFs or other images in order to add to their visual appeal and attract more users to partake in the poll itself. 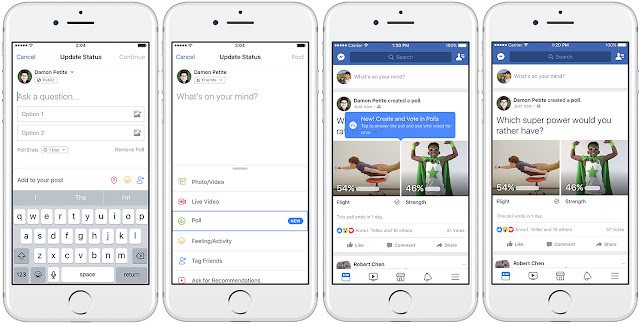 It is somewhat strange that Facebook have chosen to limit the polling feature to a maximum of two potential answers – Engadget speculate that this is likely due to Facebook’s desire for a more image-orientated approach for which the mobile layout lends itself better to a two-option limit. It is also worth noting that these polls are not anonymous, meaning that both the creator of the poll and any who choose to answer it will also be able to see any response you may have given yourself. That’s about all there is to say about this update, small as it is; though its potential applications may turn out to be wider-reaching than we first expect.